Hi-Fi cosmetics is an indie brand that has been on my radar for a while now, but I never got the real urge to actually take the plunge. Well that's over now as I bought the sample set of Hi-Fi's Evil From Beyond halloween collection. I also purchased a full-size version of 2 other eyeshadow shades from their core colours and a lip gloss that is also a part of the Evil From beyond collection. 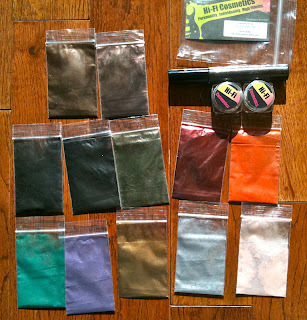 Before the swatches I'm just going to talk a bit about my experience with the company. Though turn around time was a little slow, everything came packaged securely and safely. Plus, they were great with the discounts and communicate easily and well with their costumers. Their facebook page is very active, which to me is a huge plus, as I can read other peoples comments and how well the company responds to various issues. 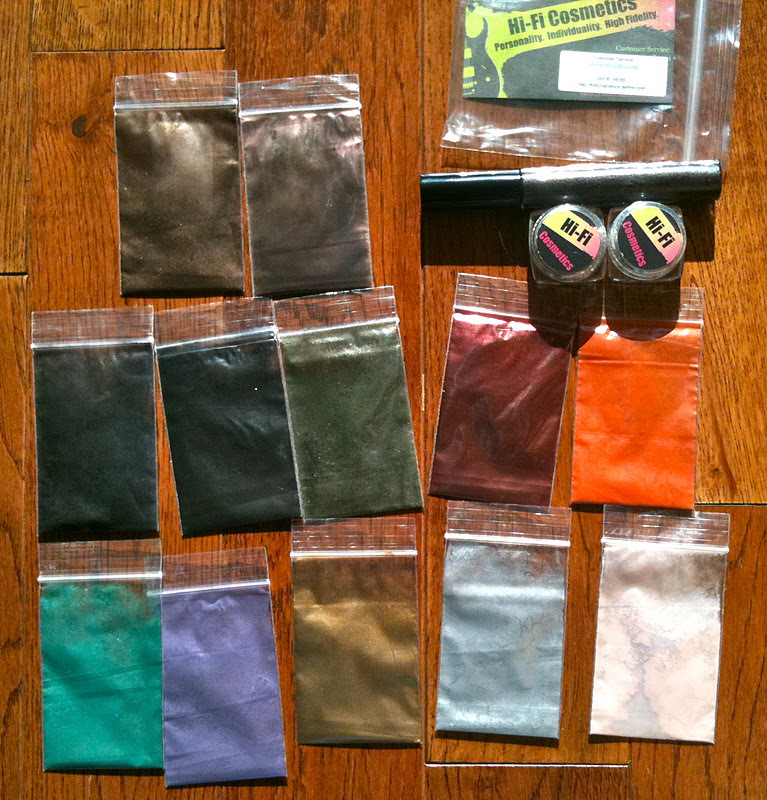 Now onto the eyeshadows! I found the lighter shades needed slightly under-pigmented, but the shadows are buildable so it wasn't too much of an issue. Plus I'm sure using some PE would help. All the shades are complex and have depth which is something I really appreciate about indie companies. They make it so there is never flat boring colours. I also love the names for the colours, I think they're really good, Vampire Club, Demon in Your Bed and Devil Tips his Hat being some of my favourites! Devil Tips His Hat gloss- click bigger to see the red sparkles! 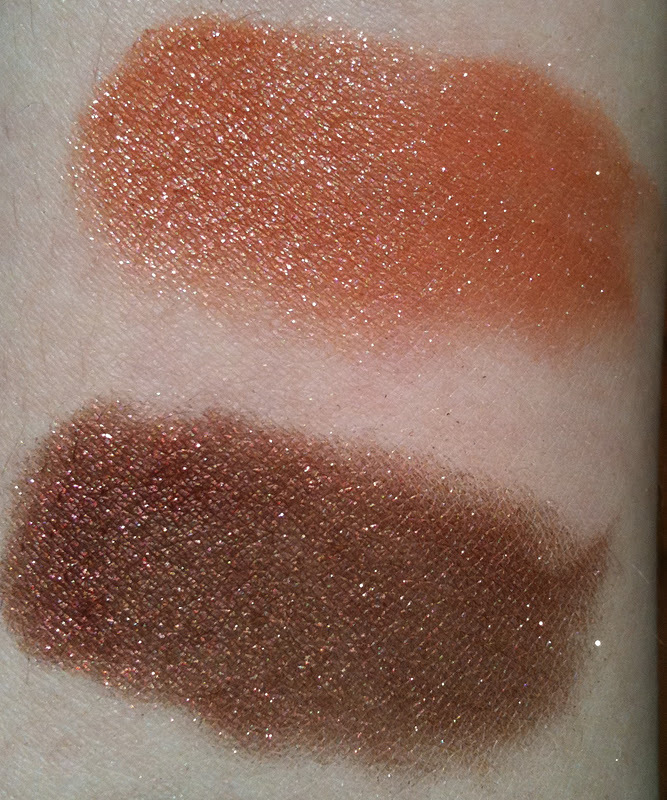 Bela Lugosi is the palest of the shadows a sort of off-white peach/pink with lots of shimmer in it. 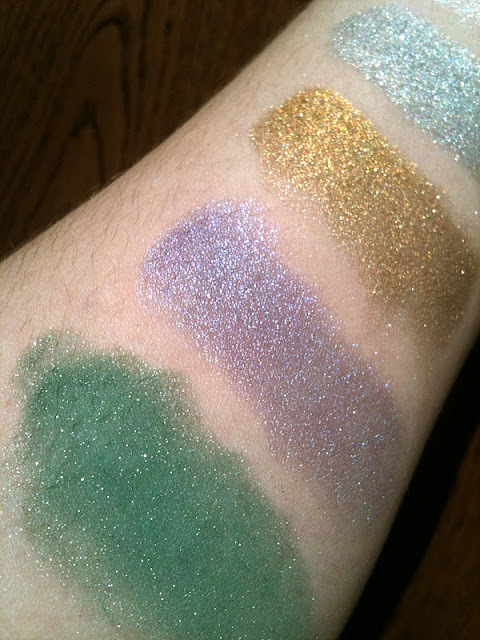 I found that it was spectacularly sparkly when swatched on my arm, but not so much on my eyes. It also lacks pigmentation a bit as I had to build it up but it is a nice shade. Sepulchre is a fairly standard silver shade. It has decent pigmentation and isn't too metallic. In some lights it can look grey. Miss Fortune is at first glance just another gold, but it isn't! From the swatch pictures above you can see it has warmth to it, at times looking brownish and burnished without ever being red. Decently pigmented. Vampire Club is a lovely muted mid-tone purple shade with reddened-purple and blue-purple shimmer to it. Swatched you can see more of this but on the lid it doesn't really show up. Not as pigmented as I would like either but a nice colour. Straight To The Devil is an emerald green shade with lighter green shimmer throughout. Pretty and decently pigmented but not too unique. Hell Hath No Fury, this shade really changes hue depending on what lighting you're in. Sometimes its red-orange, sometimes brown-orange, and sometimes pumpkin orange. 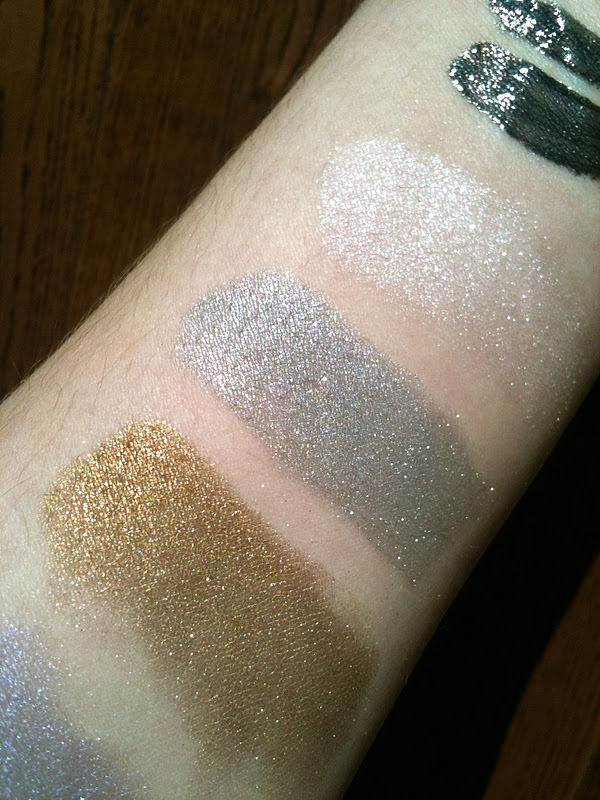 Throughout it has a bunch of gold sparkles which makes for a unique shade, I haven't even seen anything like it. Decently pigmented. A Vampire Scorned the name of this one makes me laugh especially when you associate it with the colour. Metallic blood red (Scorning Vampires isn't a good idea obviously). It has a strong brown undertone to it so it truly does resemble the real colour of blood. Only metallic. Good pigmentation. Book of Lore took me by surprise. I honestly didn't think I was going to like this one all that much but it ended up being one of my favourites from the set. 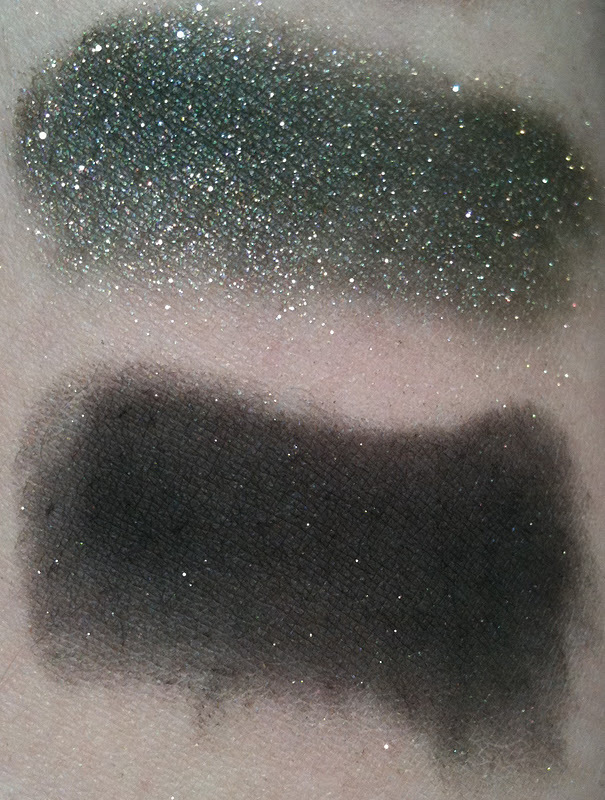 Book of Lore is a murky complex olive green with insane lighter green shimmer. 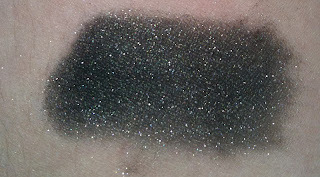 This one is really awesome and transforms from meh in the bag to O_O when swatched. Good pigmentation. Damned Soul this one has to be my biggest disappointment. 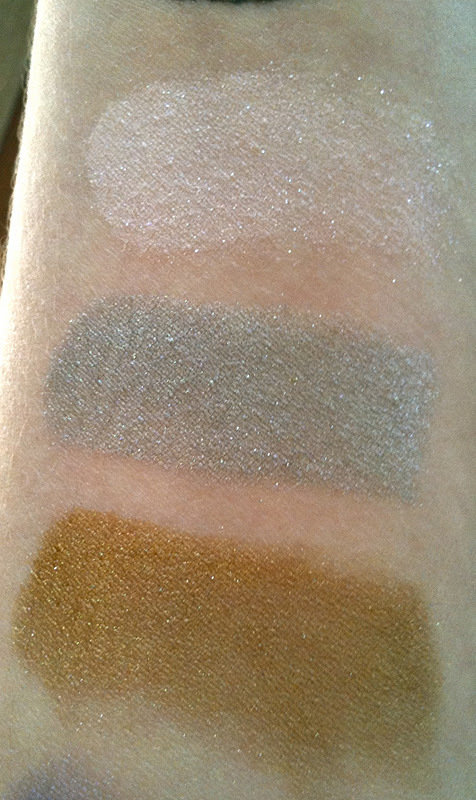 I liked the swatch on the website way better than the shadow that I got. Basically this is a matte black with some silver glitter. I found it slightly difficult to swatch too. 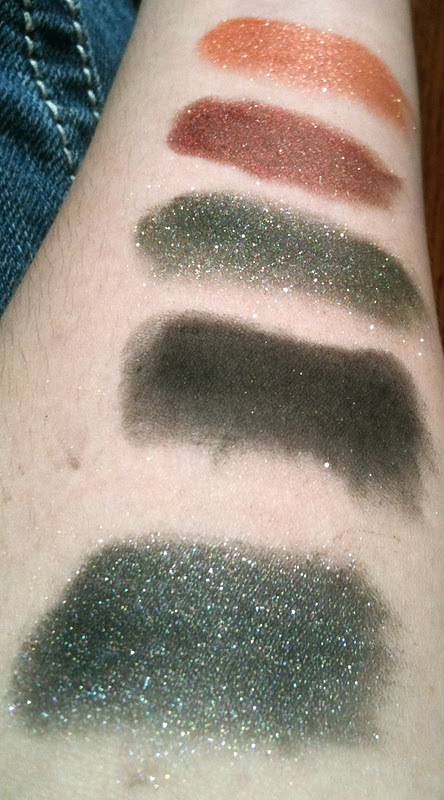 Which is a shame because in the bag you can see all this dark green sparkle and it just doesn't show up. Demon In Your Bed Hehe, this name makes me giggle too! This is my favourite shade from the collection, a complex super sparkly gunmetal. Instant smokey eye material right here! Now the gloss Devil Tips His Hat is awesome! Very similar in formula to my HG glosses the Venomous Cosmetics Lip Poisons, this is a Spotlight Lip glaze. It's moisturizing, long wearing and non-sticky. Just awesome. Plus the colour is super striking! 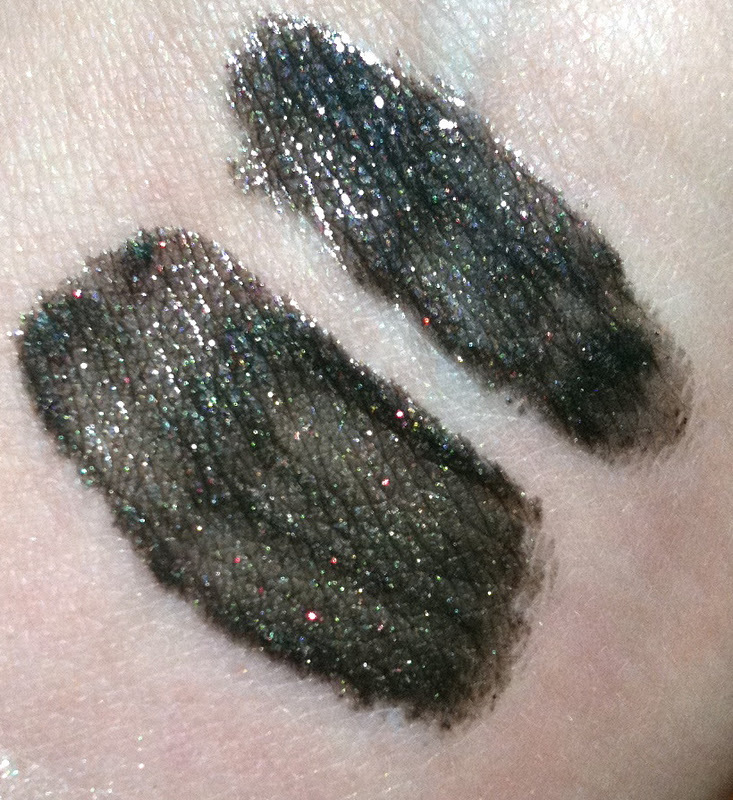 It is a charcoal black with almost some silver metallic hints and red glitter. The red glitter doesn't really show up on but I love it! Completely freaked some people out today by wearing it and smiling at them. People really don't expect goth lips to smile, hehe. If you like your black lips I highly recommend this gloss for you. Plus you get a TON, I don't think I'll ever run out with how big the tube is! Overall, I think I found some gems in this collection. There were a couple duds but I'm happy I decided to order from Hi-Fi and am looking forward to trying more of their products, especially their spotlight lip glazes. Would I buy this again? There are certain shades I would buy again, Book of Lore, Demon In Your Bed, Hell Hath No Fury in particular, some of the others though I wasn't impressed enough to purchase once my sample is used. I do love the Devil Tips His Hat Spotlight Lip Glaze though and would like to try more of those. Book of Lore caught my eye the most out of all of them! So lovely! @Mandy: Book of Lore really was a standout for me and normally I don't like olive green shades! @Rach: I'll have to look at some of the brighter shades next time! 2 Nars Duos for just $10 each! Cult Nails Winter Pre-Sale- This Weekend Only!